Managing sound to the patient’s benefit can help patients to heal. 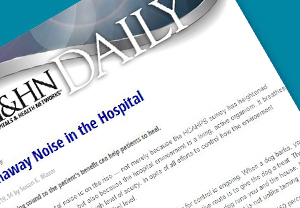 Attention to hospital noise is on the rise — not merely because the HCAHPS survey has heightened awareness of the issue, but also because the hospital environment is a living, active organism. It breathes, it speaks and it has its own high level of acuity. In spite of all efforts to control how the environment sounds, it has its own life and decibel level.